We act as credit brokers and we are not a lender. We will introduce you to a limited number of lenders who may be able to help finance your purchase. These lenders may or may not pay us for the introduction. †Includes £1500 Deposit Allowance Paid By Manufacturer. *Excess mileage charge of 10.8p per mile. If you exceed this annual mileage then excess mileage charges will be applied by the finance provider at the end of the agreement should you choose to return the vehicle. Finance subject to status. A guarantee may be required. Terms and conditions apply. Unless otherwise stated, metallic paint at extra cost. Library image for illustration purposes only. 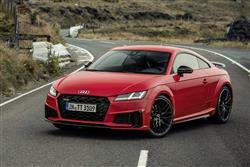 The Audi TTS has often been damned with faint praise as a driver's car but the latest version demands respect. There's now a little less power (306PS instead of 310PS) but a little more torque which makes the sixty sprint doable in as little as 4.5s. 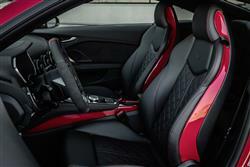 Plus, as before, there's an interior that makes a Porsche 718 Cayman look a bit LIDL. The Audi TTS quattro is a more focused version of the brand's normal 2.0-litre petrol-engined TT. Introduced as a spicier option in the car's second generation, it sat then - and sits now - just below the TT RS range-topper. For many buyers much of the time, it has long represented the sweet spot in the model line-up. 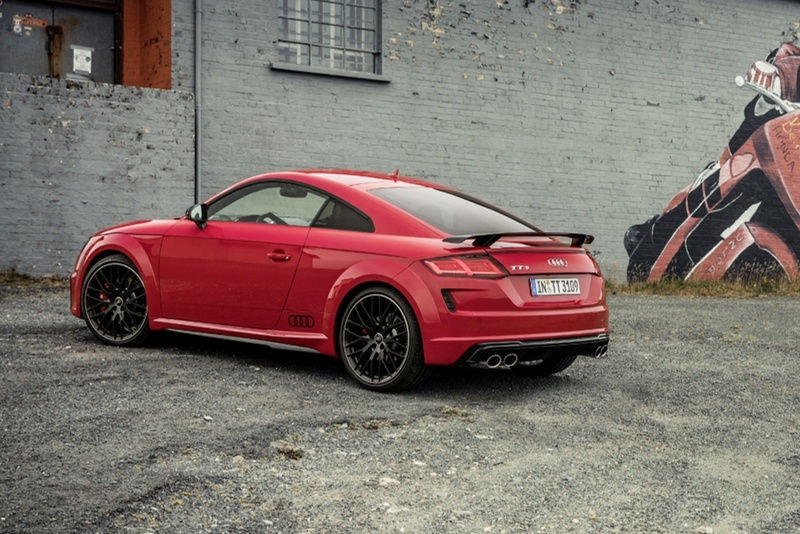 The TTS has always made a really good road car. Yes, it might sometimes have seemed a bit under-baked in comparison to an entry-level Porsche 718 Cayman on a track, but there was a flow and suppleness about it on road, coupled with a quite lovely interior that belied its position as the 'one in the middle'. This improved version continues to be worth your attention. The much-garlanded 2.0-litre TFSI engine that powers the TTS now packs a heavy duty 306PS (that's down from 310PS in this improved model because Audi has added a petrol particulate filter). At the same time, a torque increase means that 0-62mph performance has fractionally improved in both Coupe and Roadster variants - the respective 4.5-second and 4.8-second sprint times are a tenth faster than before. The top speed is limited to 155mph. As ever, the Quattro 4WD drivetrain is a highlight. The driver can adjust the operating parameters of the all-wheel-drive system to one of five modes. In the "auto" setting, optimum traction and balanced driving dynamics are given priority. In "dynamic" mode, torque is distributed to the rear axle earlier and to a higher degree. In the drive select "efficiency" mode, the system can temporarily shut down the quattro set-up if conditions suit this. As before, there's a six-speed manual gearbox or optional six-speed S tronic twin-clutch transmission. 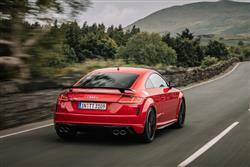 'S-specific' suspension with Audi magnetic ride adaptive damper control is standard. And progressive steering is fitted for increased response in corners and reduced load during low speed manoeuvre. Along with wheel-selective torque control which optimises handling by means of precise brake interventions on the unloaded wheels on the inside of a bend. The TTS manages to look a little more athletic than its less powerful siblings, whether you choose it in coupe or roadster guises. 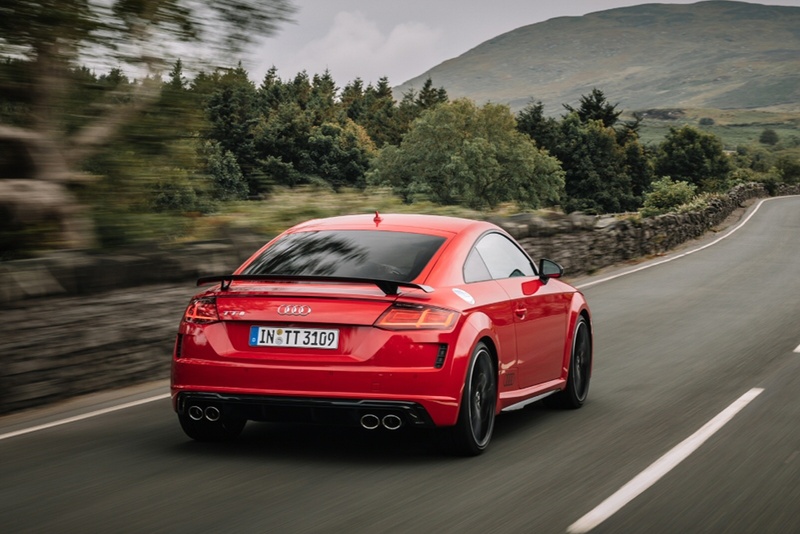 That might be due to the lowered ride height, the TTS-specific front and rear bumper assemblies or possibly the 19-inch alloys, but your eyes will also alight on the small details like the aluminium-effect door mirror cappings, the TTS badging and the all-weather LED headlights. This enhanced model gets a revised design for the three-dimensional Singleframe radiator grille. The fascia is dominated by the Audi Virtual Cockpit, now featuring an additional sport display providing information on engine output, torque and g forces. Located directly behind the steering wheel, a 1440 x 540 pixel, 12.3-inch digital screen shows all information directly in front of the driver. Operated via the MMI Touch button, voice control and the multi-function steering wheel, the display can be switched between 'classic', with prominent speedometer and rev counter, or 'infotainment', which brings functions such as the navigation map or media to the fore. The round air vents - a classic TT feature - are reminiscent of jet engines with their turbine-like design. The vents also contain all the controls for the air conditioning system, including seat heating where applicable, plus temperature, direction, air distribution and air flow strength. As an option, they can also house small digital displays which show the chosen setting. A 2+2, the TTS Coupe gets a load area with a capacity of 305-litres, which can be extended by folding the rear seat backrests forwards. 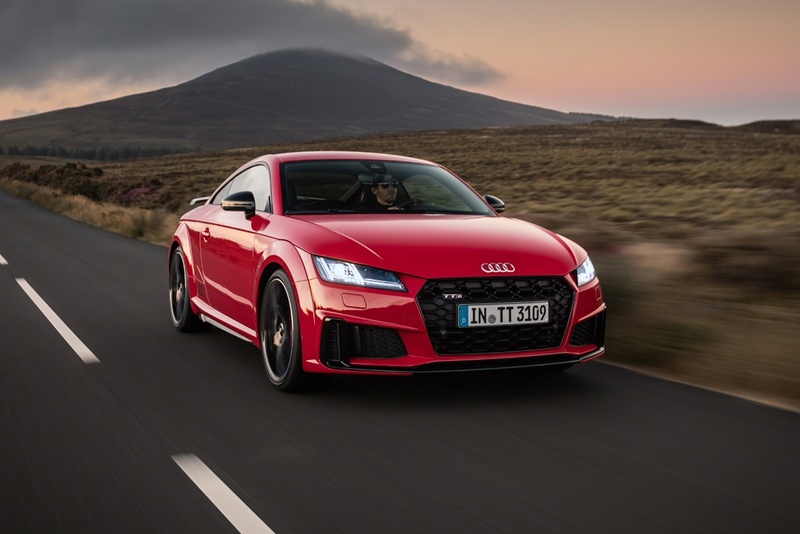 Prices kick off at around £32,000 for a normal 230PS 2.0-litre TTS coupe, so there's a big jump of nearly £10,000 to the asking figure for a TTS Coupe - around £42,000. Around £1,600 more gets you plusher 'Black Edition' trim. Budget around £2,000 more for the Roadster body style. 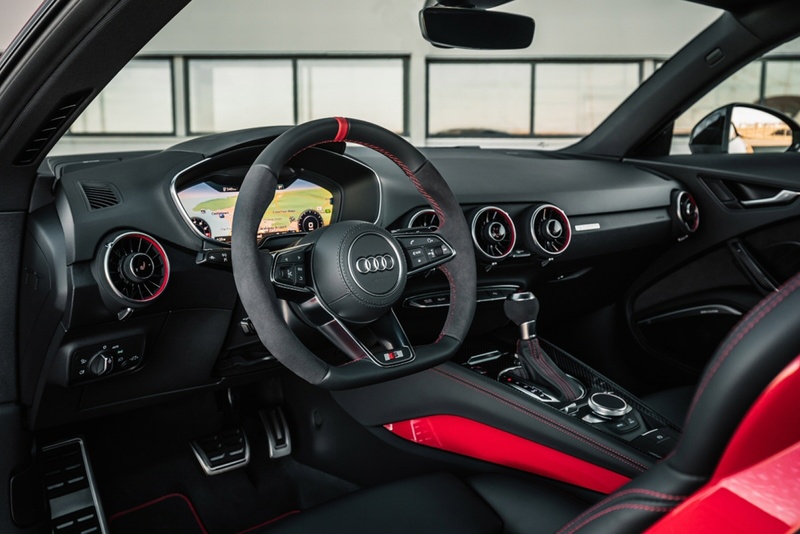 Both trim levels now benefit from a Technology Pack incorporating Audi's hard disc-based 'MMI Navigation Plus' infotainment package, as well as a three-year subscription to the many internet-based Audi Connect infotainment services and Audi Phone Box wireless handset charging. The TTS Black Edition variant gets a fixed rear spoiler and 20-inch wheels, plus it incorporates the high end Chrome slate grey and Piano black interior elements. Other equipment highlights include an extended leather package, an auto dimming rear view mirror, inlays in brushed aluminium, TTS badges on the steering wheel, a retractable rear spoiler, Audi Lane Assist, tyre pressure monitoring, heated front seats and an ISOFIX child seat mount on the front passenger seat, along with the necessary airbag deactivation. The TTS returns some decent efficiency figures for a car with such a knockout accelerative punch. Emissions on the manual coupe are rated at 168g/km and the S tronic fares even better, recording 159g/km. The warranty covers you for unlimited mileage in the first two years of ownership and up to 60,000 miles in the third year and is transferable between owners. Pay more and that can be extended to a fourth year, again with unlimited miles in the first and second years but a more generous 75,000 mile allowance in years three and four. When it comes to maintenance, servicing your TTS should be no more taxing than is the case with one of the company's lesser models. As usual with Audi, there's a choice of either a 'Fixed' or a 'Flexible' servicing regime, the choice between the two depending on the extent of your likely annual mileage. Residual values look set to be very beefy if previous TTS models are anything to go by. If you’re looking for a new Audi TT 50 TFSI Quattro TTS 2dr S Tronic Petrol Coupe for sale, you’ve come to the right place. At Bristol Street Motors we don’t just have the best Audi TT 50 TFSI Quattro TTS 2dr S Tronic Petrol Coupe deals, we also offer friendly advice and help with all your enquiries to ensure your buying experience is a happy experience.